Aberdeen has long been one of the UK’s most economically buoyant cities. 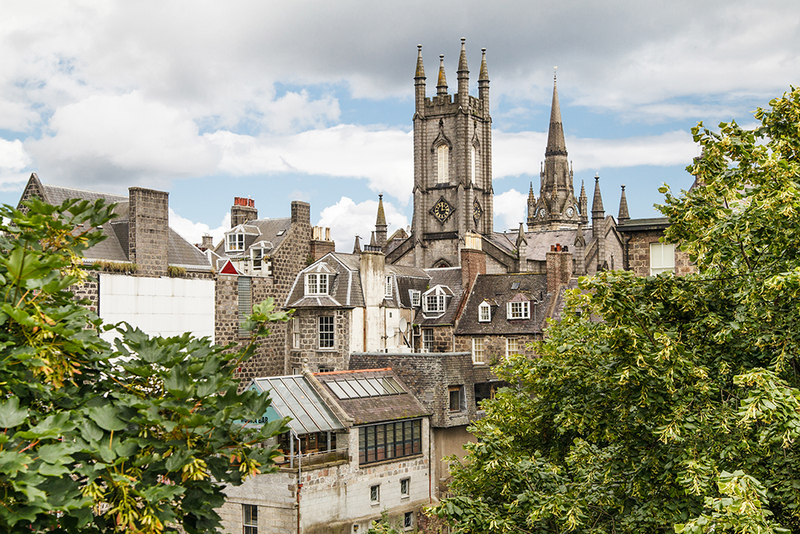 In the eleven years that Centre for Cities has published Cities Outlook – our annual health-check on UK city economies – Aberdeen has ranked among the best performing cities when it comes to wages, skill-levels and innovation. This year’s Cities Outlook shows that Aberdeen continues to be a strong performer, with impressive figures for number of skilled workers, patent applications published and average wages. However, the downturn in the city’s standing in a number of key areas in recent years suggests that all may not be well in the Granite City’s economy. In terms of population, Aberdeen is the only city in the UK to see a decline in its number of residents between 2015 and 2016 – a fall of -0.3 per cent. This was driven by a sharp decline in those aged 20-24.
Business closures per capita have increased by 76 per cent while business start-up rates have decreased by 21 percent per cent between 2013 and 2016. The employment rate was 2.7 percentage points lower in 2016 than in 2014. Gross value added data shows that the economy was 7 per cent smaller in 2016 than 2014. As this isn’t adjusted for inflation, the real terms fall will have been even larger. House prices have fallen by 9 percent since 2015. While local data is not detailed enough to say conclusively, Aberdeen’s economy appears to have been in recession in recent years. And this is counter to the experiences of other UK cities. While Aberdeen’s reliance on oil and gas appeared to shelter the city from the worst of the global financial crisis, the oil sector’s recent turbulence has pulled the city into reverse at a time when other cities have been slowly improving. So what’s going on? Much of this is likely to be down to Aberdeen’s dependence on the oil industry, which has hitherto been the source of the city’s economic success. However, in recent years there has been a well-publicised global slump in oil prices, with prices dropping from a peak of $115 per barrel in June 2014 to a low of $26 per barrel in January 2016. Prices have increased more recently, but remain around $50 below their 2014 peak. Reliance on an individual sector means that your fortunes are hooked on the performance of that sector. And this is something that has been seen throughout the last century – a number of cities have struggled after they’ve seen a decline of a dominant industry, be that steel in Sheffield (which accounted for 24 per cent in 1911), mining in Wakefield (which provided one in three jobs in 1911) or textiles in Burnley (which accounted for over half of all jobs in 1911). While cities tend to be much more diversified today than they did 100 years ago, cities such as Sunderland (Nissan) and Derby (Rolls Royce) continue to be reliant on individual businesses to generate a large bulk of their exports. Diversifying their economies now by attracting in a broader range of business investment would help offset any future troubles that these businesses may face. Despite the risks that an over-reliance on a small number of industries poses for places, the Government’s Industrial Strategy has a strong sectoral dimension to it. The worry here is that will encourage cities to focus their local industrial strategies on what they perceive to be their sector strengths, rather than setting out a plan to attract in business investment from a range of sources. To do this requires an understanding of what the barriers that a city faces to attracting business investment are, and a set of coherent policies to overcome this. Aberdeen’s recent City Deal very much focused on oil and gas, with three quarters of the £250 million deal dedicated to establishment of Oil and Gas Technology Centre (which opened in February 2017). This is likely to be a great asset for the city while the sector is located in the city, but it does little to help it broaden the activities based there. Aberdeen’s over reliance on oil and gas led to the creation in 2015 of Opportunity North East (ONE), a private sector economic development body established with the aim of diversifying the local economy. While ONE’s identification of a handful of sectors (food, drink and agriculture, life sciences, tourism) runs the risk of being too focused on sectors and not the drivers of business investment, the formation of this organisation reflects that fact that it’s not just the job of the public sector to help places adapt to on-going change – and that private sector will also have an important role to play. The local industrial strategies should define exactly what that role is.